Regular readers of this blog will have 'heard' me rail against the way quality Kiwi crime and thriller writers have been overlooked and undervalued - particularly by our own media, festival organisers, book prize judges, booksellers, and therefore readers - both now and in the past. I am somewhat hopeful that things are beginning to change, little by little - with several local crime and thriller authors now being published and supported by the 'big publishers', and seemingly getting increased exposure in terms of both the media (reviews and interviews) and booksellers' shelves. Would I like to see more support? Yes, of course. But things do seem to be (slowly) heading in the right direction. But along with the current Kiwi authors publishing in New Zealand (and overseas), there are also some Kiwi authors who are only publishing overseas (exacerbating their 'overlooked' status downunder), even if they live here. Today I want to focus on the most recent books (released overseas in 2009, but not yet in New Zealand) of two such authors; Andrew Grant and Colin D. Peel. A bit of a mea culpa on my part - until very recently I hadn't included either author's latest works on my "Recent Kiwi crime, mystery, suspense, or thriller releases" sidebar. I was guilty of overlooking them myself. This is the second thriller in an Asia-set series, starring former British secret agent and assassin Daniel Swann, written by 'Andrew Grant' (the thriller writing pen name of Christchurch-based Grant Shanks, who writes in a variety of genres), and follows on from 2007's DEATH IN THE KINGDOM. Overall it's the fifth thriller Shanks has penned under the 'Andrew Grant' name over the past decade-plus. His first two thrillers, HAWK (a local bestseller) and TYLER'S GOLD, were set in New Zealand. His award-winning third thriller, MESQUITE SMOKE DANCE, was an American police psychological thriller set in Texas. According to the publisher's blurb, "In SINGAPORE SLING SHOT, former British agent Daniel Swann is living in semi-retirement in Hong Kong when he receives a call for help from his old friend, Thai drug lord Sami Somsak. Sami’s stepbrother and his family have been murdered, and Sami’s brainchild, the $6-billion Intella Island project, Singapore’s largest offshore construction, is in jeopardy. When Swann attempts to retrieve vital evidence hidden in Fort Siloso, a bloody gun battle erupts on Sentosa island, and staid, quiet Singapore becomes a raging battlefield. Chinese Triads, a ruthless Colombian drug cartel ,and a shipping container holding $2 billion dollars converge on Singapore as Swann and his associates battle to save the Intella Island project and seek their revenge on Singapore’s unscrupulous Thomas Lu - the man they call The Undertaker." I understand that SINGAPORE SLING SHOT is likely to be released in New Zealand in the coming months, which is great news. 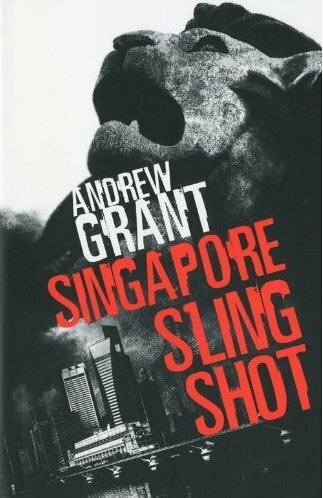 By the way, you can view an interesting 2007 interview with Andrew Grant, on Channel News Asia, about his first fast-paced Asian-set thriller, here. Another New Zealand-based author who has published several thrillers overseas, but is fairly overlooked here in New Zealand, is Colin D. Peel, who lives on "a remote peninsula" in the northern part of the North Island. Peel has published more than twenty novels since 1972, with most being published by UK-based Robert Hale Publishing (who over the years have also published other NZ-based crime/thriller writers like Freda Bream). Several of Peel's novels have also been published in the USA by St Martin's Press, and overall his books have been published in 10 countries, and translated into six languages. There are also audio-book and large print versions. Peel's passion for 'international thrillers' can possibly be tied to his earlier career designing weapon systems in the aerospace industries of Europe and North America. According to his website, his stories "range from terrorism and nuclear-testing to gun-running, the heroin business, diamond smuggling and the illegal market for plutonium." 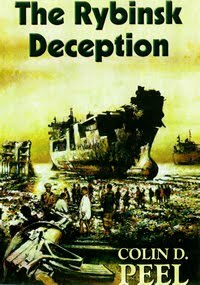 Peel's latest book, released in 2009, is THE RYBINSK DECEPTION. The publisher's blurb states: "David Coburn: working undercover, but profiting from the activities of the remote outpost he is supposed to have infiltrated. Hari Tan: sapphire trader turned modern-day pirate preying on shipping in the Malacca Strait. Heather Cameron: UNICEF nurse struggling to prevent the exploitation of children on a beach of toxic waste. Luther O'Halloran: nuclear defense analyst on assignment to the US National Counter-Proliferation Center. These are the four people whose futures hang in the balance when the crew of a Russian supertanker are found dying of radiation poisoning. There is a conspiracy so menacing that unless Coburn can halt an attack on a warship in the Yellow Sea, the US will be forced into conflict with an enemy having a nuclear arsenal that this time will be frighteningly real." It certainly sounds intriguing (and takes me back to my days of reading the likes of Alistair MacLean, Desmond Bagley, and Tom Clancy, growing up), and I will be trying to get my hands on a copy soon. So have any of you read any of the thrillers penned by Andrew Grant (the New Zealand-based one - Lee Child's little brother is now also writing thrillers under the name Andrew Grant, which is understandable given that is his real name) or Colin D. Peel? If so, what did you think? Do either of the books above intrigue you? Thoughts and comments welcome. I've got two of Colin Peel's books which I must re read before I can comment but that might be awhile since I've been busy rounding up Paul Cleave's books. Did a check on the Wanganui Public Library and they have most of Peel's books and to of the Andrew Grant ones. O well school holidays coming up so more reading time. Thank you for your article. More books to look out for. What do you think of Paul Cleave's books tilleyhelen?